You know that I am always looking for different and fun parenting products to introduce to you here at Lunchbox Dad. When I found Evie Bett a few months ago, I knew their products were unique and my readers needed to hear about them. They make amazing diaper bags, lunch coolers, and clutches for moms who want something stylish and different. Lucky for you, Evie Bett is giving you the chance to choose your own diaper bag or lunch cooler from their collection (valued at over $200)! This would be perfect for Mother's Day, a baby shower present, or just because you need an awesome new bag. I guarantee you won't find bags like these anywhere else. When I met the owner I knew this was a different sort of company as well. Their mission is to "help busy women keep it together in enviable style. Our thoughtful details help you be prepared for anything, and rediscover a frazzle-free peace of mind. Sleek, sophisticated designs pack everything from healthy snacks and workday essentials to baby bottles and bibs." My wife has been trying out the Vivien Diaper Bag. Let me tell you it looks like a designer purse, but it functions like a combo purse/diaper bag. It is quality made and you can fit just about anything you want in there. In the picture below you can see that we fit in a lunchbox, changing pad, tablet, change of clothes, and much more! Because of all the straps you can hold it many different ways, and it also has built in stroller straps. Each diaper bag also comes with a changing pad and two washable pouches for bottles and snacks. These bags come in many different styles and colors so you can find one that fits you perfectly. This is not a boring bag that will look like everyone else's, it will make people do a double take and ask you where you got it. You can easily enter to win the Evie Bett bag of your choice using the Rafflecopter widget below! The hardest part will be choosing which bag to make yours. This giveaway is for one bag. Valid for U.S. mailing addresses only. Please see the official rules for all the details. 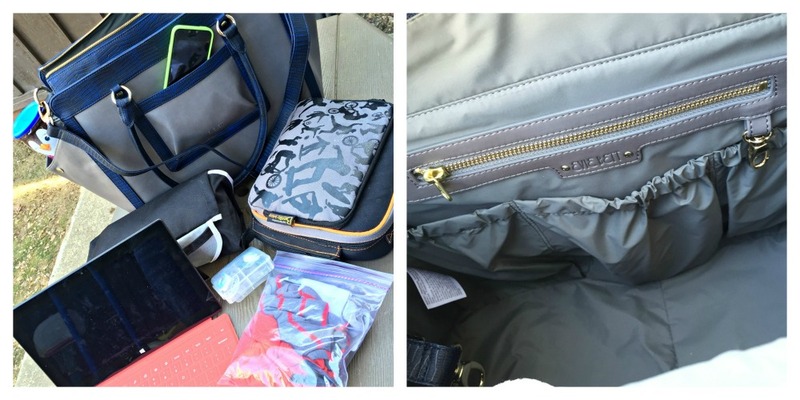 Disclosure: I was provided a diaper bag by Evie Bett for the purpose of pictures and for the giveaway. I was not compensated in any way and the opinions expressed are my own. With a new baby due in just a couple of weeks, I would have to let my wife look through them and chose the perfect one for her! I want a bag! I have things I like to carry and a bag would be perfect to do that. I'd choose the Lana. Thanks for the giveaway! I'd like the Ava diaper bag. I would choose the Ava Diaper Bag - Came. Love the style! I love the Ava Diaper Bag in camel. These are amazingly well designed bags with a functional purpose- Style & functionality I can totally support. The Vivien, I love the outer pockets! I'd love the Vivian diaper bag in charcoal! It's gorgeous! I would choose the Ava diaper bag. Love the Ava bag in black or camel! It's beautiful!!! I really like the Camel Ava Diaper Bag! Dr. Seuss Day Thing 1 & Thing 2 Lunch!